The best bird foods include proteins, fats, carbohydrates, vitamins, and minerals, much like a human diet. In the wild some birds get these nutrients exclusively from animal protein such as insects and their eggs and larvae. Some eat both bugs plus seeds. Others eat only seeds after they mature beyond the nestling stage. 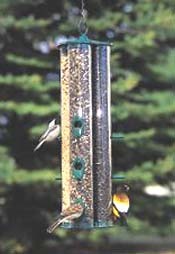 Offer a variety of bird feed in your feeders to attract many kinds of birds. Carbohydrates and vitamins--Yellow corn, crushed or cracked for smaller birds, proso millet, sorghum, wheat, fruits, nectar. Protein--peanuts, peanut butter, hemp seeds, and (especially) sunflower seeds. Fats--suet, peanut butter, pecan meats and other nutmeats, stale pastry. From a simple platform feeder made from a board set a few inches above the ground to a sturdy commercial bird feeder, there is a design that will suit your situation (and pocketbook). 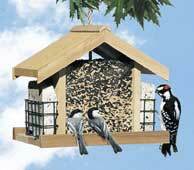 Feeders are made of plastic, metal, wire netting, wood, ceramic, terra cotta, or glass. A well-designed feeder stores sufficient seed so that it does not need constant refilling. It also keeps the seeds dry, is reasonably squirrel proof and is easy to clean. Sparrows, doves, quail, juncos, and towhees are ground feeders. Cardinals, finches, chickadees, titmice, nuthatches, grosbeaks, blue jays, migrating warblers and thrushes prefer hanging and platform feeders. Woodpeckers, flickers, starlings and other insect eating birds visit suet or birdfood cake feeders that are fastened to a hanging feeder or tree trunk. Hummingbirds and orioles will come readily to a hummingbird feeder.